"How ironic. In the very same week that Gordon Brown stood up in Parliament and claimed that he was saving the world, the world answered back. In a matter of just a few days, the German Finance Minister described Mr Brown’s reckless borrowing as "crass" and "depressing", international currency markets sent the pound to a new low against the euro, and it has become clear that the British bank recapitalisation plan is the most expensive in Europe." "Peer Steinbruck’s comments have nothing whatsoever to do with internal German politics, as Prime Minister Brown has suggested. The tremendous amount of debt being offered by Britain shows a complete failure of Labour policy. In questioning the British government’s approach, Peer Steinbruck is exactly expressing the views of the German Grand Coalition. After years of lecturing us on how we need to share in the gains of uncontrolled financial markets, the Labour politicians can’t now expect us to share in its losses. The tremendous amount of debt being offered by Britain shows a complete failure of Labour policy." "Germans are profoundly averse to debt and, since the collapse of the currency in the Weimar Republic in the 1920s, they have remained terrified of inflation. Nor do they trust pump-priming; they tried that after the 1973 oil shock, they point out, and all it did was drive up public debt. Their reaction to emergency spending by government is to save against the day when the bills come due. More debt today, they reckon, means higher taxes tomorrow. A Chancellor who keeps her powder dry is just their cup of chocolate." 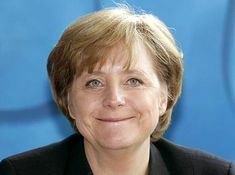 The Guardian has labelled Angela Merkel ‘Frau Nein’ after she adopted ‘go-it-alone’ positions on a range of issues. In addition to her attitude to borrowing she "opposes any common EU policy that could be seen as confrontational towards Russia"; "has led resistance to the European commission’s carbon trading proposals"; and "has frustrated Washington, London and Paris by resisting the imposition of meaningful economic sanctions on Iran over its nuclear programme".